I love the idea of YA shifter romance. It’s not something I’ve seen much before, but this is my second one this year so I’m hoping it’s going to be a thing. 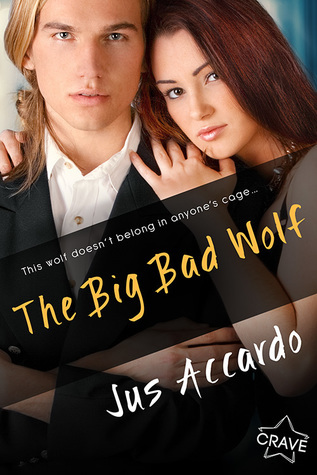 Big Bad Wolf could have borrowed its storyline from any number of ‘90s teen movies. Like Drive Me Crazy with werewolves maybe. Kensey and Slade are next-door neighbors who were childhood best friends but had a falling out in middle school. But when both their fathers demand they choose a mate or have one chosen for them—this part is squicky since they’re seventeen—they come up with a fake relationship scheme. The romance plot could have been borrowed from any number of shifter novels as well. Their fake relationship turns in to something real but they belong to different packs so their families don’t approve. She’s a spoiled princess and he’s not good enough for her—too violent, too feral, too damaged. She makes him a better person, but he keeps pushing her away to save her from him. What’s new is that the characters are in high school so the pack kids all have their own cliques, they skip class to shift and run in the woods, and the signal to everyone that they’re together is holding hands in the hallway. Since they’re werewolves, there are some dark moments as well. Mostly courtesy of Slade’s father and the ruthless way he runs his pack. The world reminds me of Rachel Vincent’s Shifters series. The pack structure is similar. So is the way the girls are commodified by their families. And the heroine, Kensey, is a little like Faythe in the way she rebels against the system. These wolves also have hereditary magic, which is interesting. Kensey’s family has elemental firepower and Slade’s has a lure, like you often see with incubi, which enslaves women. Passing on those powers is the rationale behind the arranged marriages. Slade’s magic, as well as his father’s, play a big role in the story but Kensey’s isn’t mentioned much. Big Bad Wolf was a quick read. I enjoyed it even though it didn’t surprise me much. I’d even be willing to read more about the world, maybe meet some members of the other packs that didn’t get much page time.